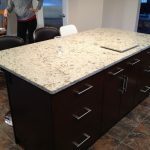 Just recently, we had a guest writer talk about different styles and materials for countertops. Instead of covering the same ground, I’ll link the article here. For our preferences, Robert says that he loves the look of granite, but hates the upkeep. Granite is a porous stone, and if the surface is not resealed regularly, it can collect food bacteria. If you’re okay with the maintenance, granite is the way to go. Michael is a fan of polished quartz. It has that great stone look without all of the maintenance. Second to that is a Corian countertop. At a recent showcase, Michael saw a white Corian countertop with LED lights placed just underneath it. When you turned the lights on, your countertop changed colour. Sure, maybe it’s a little gimmicky, but it did solve the issue of not liking the colour of your countertop after it’s been installed. For a detailed look at countertops, click here to read what Aaron Woods over at Floform has to say. A great kitchen remodel won’t look good without proper lighting. A great place to start with lighting is your kitchen windows. Enlarging a window or adding another window can often provide a lot more light without messing around with your electrical systems in your kitchen. Our biggest recommendation for windows in your kitchen is that you put in the right ones. We find that the humidity levels in your kitchen are higher than the rest of your home and the windows tend to frost or fog up. Installing triple pane windows rather than dual pane ones will help prevent this. Your lights in your kitchen are also important. We won’t get into too many details here about lighting fixtures, but remember that if you kitchen is darker in colour, more lighting may be required. Don’t forget about adding lights to your pantry and under your cabinets. For the final part of this feature, where we go over our final thoughts, and feature some of the kitchens we’ve worked on, click here. If you’re in the Greater Edmonton area and are looking for a contractor for you renovation project, visit our website at www.nordalta.com/contact/ to find information on how to contact us. We’d be happy to speak to you about what we can do to get the ball rolling on your next home or office project. You can also leave comments with us at robert@nordalta.com. Robert Breault is the president and owner of Nord Alta Construction. You can find the company website at www.nordalta.com. You can also find Robert and Nord Alta Construction on facebook at www.facebook.com/NordAltaContructionand on LinkedIn.